While I already knew this stitch when it was presented to me in a workshop, it still surprised me. It's another stunning example of why one shouldn't associate a stitch with a single theme...or thread combo. Lastly, I hope you aren't tired of the Beetle Stitch yet because today is another riff on it. What differentiates the Beetle Stitch this week is its application and the thread combos. Let's start with the stitched sample. It combines Burmilana and Fuzzy Stuff and I absolutely love it. I was so pleasantly surprised to see this combination because, up to that point, I had always considered the Beetle Stitch as a background stitch and I had always associated Fuzzy Stuff with random French Knots or random long stitches. Due to the size of the Polar Bear, the actual stitch sequence is a little taller than versions I've shared previously. It is highly likely you already know that leaf stitches make fabulous stitches for birds. While there are a ton of leaf stitches, I selected two for you. The first is what I consider a classic leaf stitch and works beautifully on the chest of a feathered friend. It's elegant and dramatic. A lightly overdyed silk or wool works well here. Pair it with a matching solid colored silk or wool for the face and you are off to the races. The next stitch is a smaller leaf stitch, perfect for a wing. It's illustrated in all the possible angles, showing how you can emphasize the direction of a wing. For a lighter touch, add an empty row in between leaves. This is a great way to show off the shading. You can also take it one step further and add a sparkly accent, such as a bead. Today's #smallspacesunday is pretty straightforward. 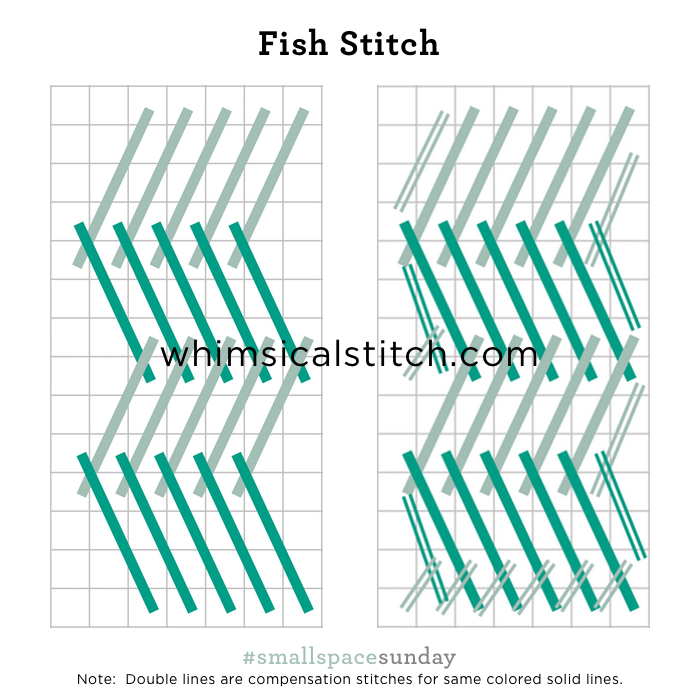 The stitches below have been covered on previous #smallspacesundays but are especially appropriate for animals, so I'm resharing here. The first is Encroaching Gobelin, perfect for almost any animal, especially a small one, because of its compact size, smoothness, and ability to change directions. The next stitch is one of my favorites. While the Cushion Stitch is more complex, it makes a great wing or body stitch as it has a bit of texture. Brick Stitch, especially over two rows is perfect for a small rabbit, duck, or squirrel. Don't forget to switch the direction to horizontal if the animal isn't sitting up. The Brick Stitch is also scalable. For a larger space, go over four rows, instead of two as diagramed below. The Upright Cross is an all-purpose small space stitch for any animal.